Museum Wiesenthaler K3 is located in the building of former Saxon royal forest administration Oberwiesenthal, Karlsbaderstrasse 3. In the premises of the historical building and the new outbuilding, you can find a tourist information centre, a museum and a library. K3 Wiesenthaler new museum was inaugurated on 13th September, 2014. 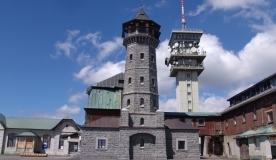 Renovation and extension of the building was part of the EU project "Intensification of tourist cooperation between the town Ostrov and the town Kurort Oberwiesenthal.